I was shooting a little reference for my next Supergirl cover when I noticed these old process pics from 41 still on the camera. For whatever reason, I never got around to posting them, so here they are now. As you can see, I drew this cover in blue pencil, a Prismacolor Col-Erase 20044 Blue to be exact. I don't always draw in blue nowadays- it depends on the piece and how I am feeling at the time. In this case, I knew that I would be drawing the final in ink, so I decided to go with the blue and then straight to pen, skipping the graphite pencil altogether. 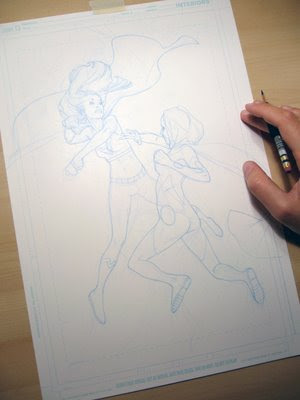 In the second image the blue pencil drawing is nearly done, save for Supergirl's skirt, which can be difficult to draw, although I generally enjoy drawing drapery. Maybe it is because her skirt is too short to allow for many folds, or because I often have to bend the rules of physics to protect Supergirl's modesty, but for whatever reason, the skirt is often drawn last. As you can see, I drew her entire body even though the skirt will cover her pelvis- it is very important to always "draw through" your images. 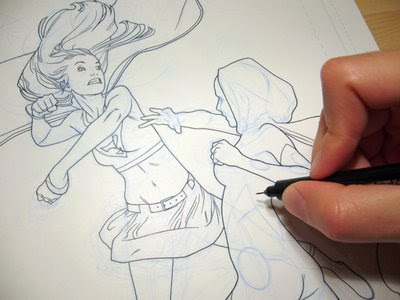 You can see that Supergirl's leg is drawn through Superwoman's body as well. 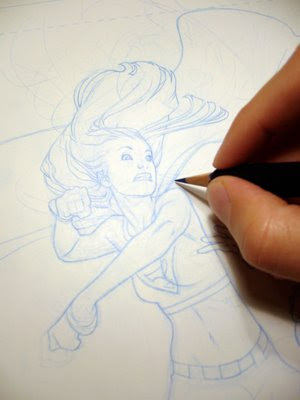 Here I am inking the blue pencils, though I don't mean "inking" in the traditional comic book sense, in that I am not going in with lineweights and spotting blacks. I was after a simple line drawing so that I could have plenty of room for color later, so I just drew the image in ink in much the same way as I would if I were using a graphite pencil. There are occasions where I will ink with lineweights and spot heavier blacks, but then I would probably use a brush. When I choose not to ink at all and draw the final in graphite, it is usually because I want to maintain a little more delicacy to the drawing while working on it. After scanning and adjusting, it doesn't really matter what I used to draw the image as long as the line quality is good. The pen is a regular disposable technical pen, of which there are several good brands. Most popular is probably the Pigma Micron series, which I like, but sometimes hurt my index finger due to the way I grip the pen (my finger falls right on the seam where the pen tapers for the cap to fit). Staedtler and Copic also make good pens. I think I am using a Copic Multiliner here. As is always the case, the best tools are what works for you. I hope these pictures are of some interest. If nothing else, they help give a sense of scale to the art. As always, thanks for stopping by.